They say that things happen for a reason and coincidences do not actually exist. We agree with that but we might add that sometimes things really do happen at the perfect moment for no obvious reason. Luckily for us, many of these moments are captured on photos and people love sharing them on social media for everyone to see. 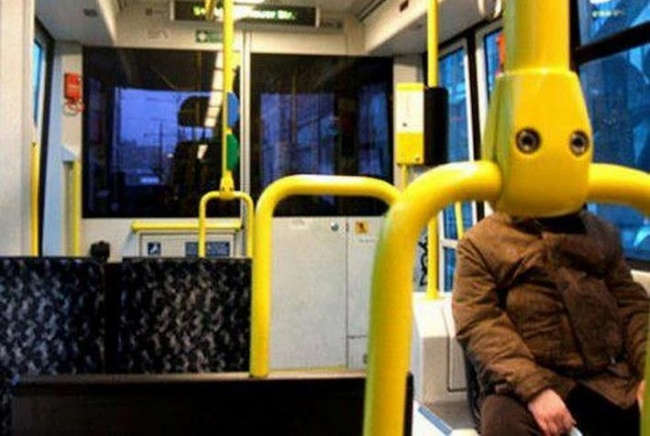 Some people recognize certain signs and give different meanings to these coincidences, but one thing is for sure – all the images are stunning and really curious to see. The image you see here is a proof that a simple coincidence can have a deeper meaning! 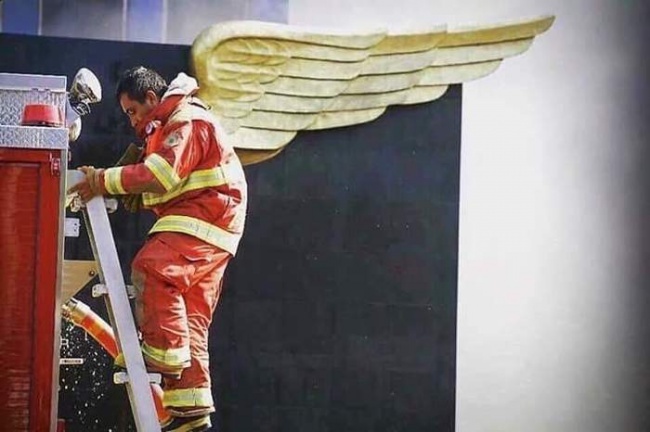 This firefighter was snapped just as he was climbing down a ladder and he happened to pass below the wings on the wall behind him. This immediately gave the man the image of a superhero! And we believe that he doesn’t need one, because these brave people are more than heroes! They risk their lives on a daily basis in the name of our safety. Every image has something that captures the attention first! No matter how many details are featured in it, we always see one of it before the rest. It is easy to see what steals everyone’s attention in this photo! We are more than certain that such an image cannot be replicated! 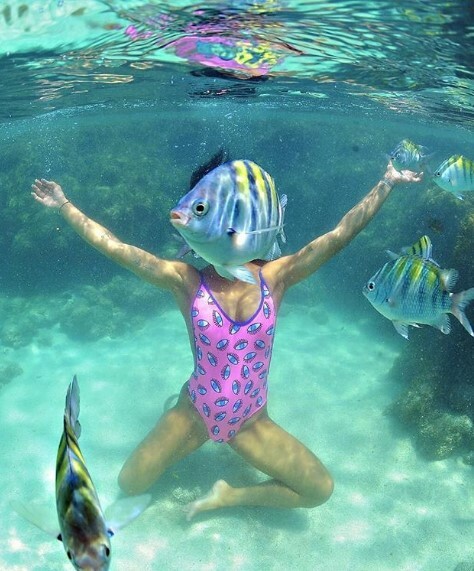 The fish happened to be in the perfect place to steal the identity of that woman. The end result is definitely hilarious and we believe that this woman loved it! Sometimes a certain photo needs to be filtered and altered in a number of ways in order for it to become truly stunning! Taking the perfect photo is definitely not enough – the added effects are the thing that matters the most. Of course, there are exceptions and this picture proves it. 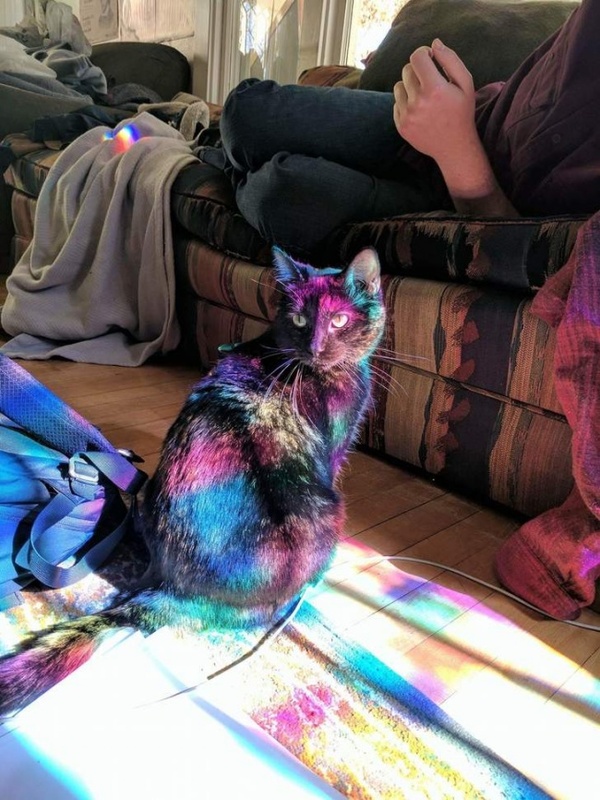 The cat happened to sit at the perfect spot when the light went through the colored glass pane. The result is one really glamorous cat. Capturing the beauty of a wave is tricky! Even the most skilled photographers out there would struggle to nail the perfect moment. The flow of the water is hard to capture on a single frame but someone was able to do it, and the image is truly unique! 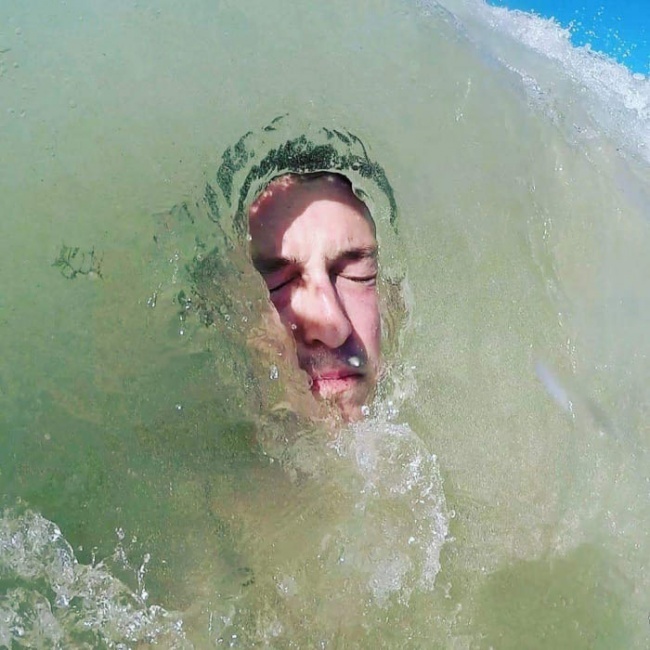 This man was just about to get fully submerged by the wave when some unknown photographer managed to capture the only possible moment! We bet that they were proud of the end result. Every marketing specialist would love to see this! 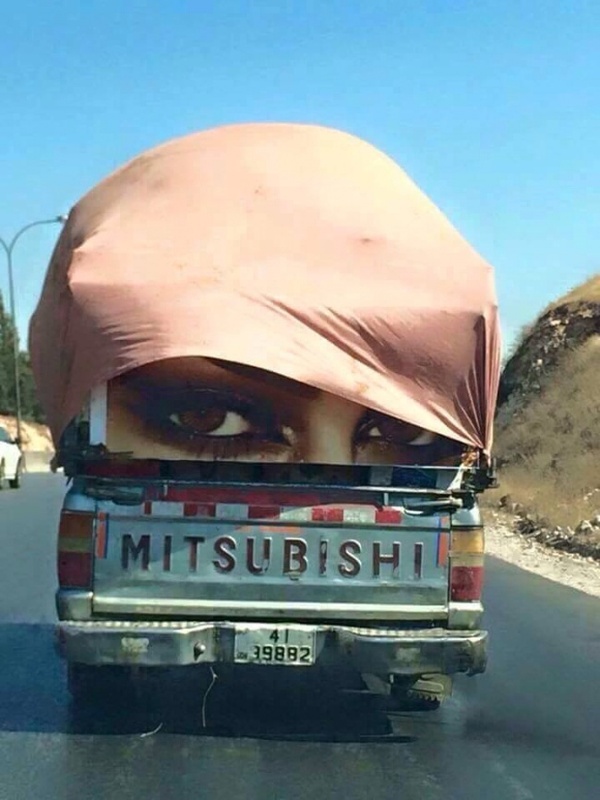 The accidental way that the load of the pickup truck ended to look like because of its cover is amazing! It reminds us of an art installation meant to look exactly like Jade! This is a rather interesting way to advertise a certain thing and we believe that it should be adopted by marketing companies. It’s like combining guerilla marketing with a delivery service, for example. 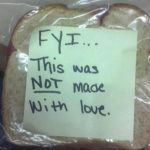 We really laughed out loud when we saw this funny image! 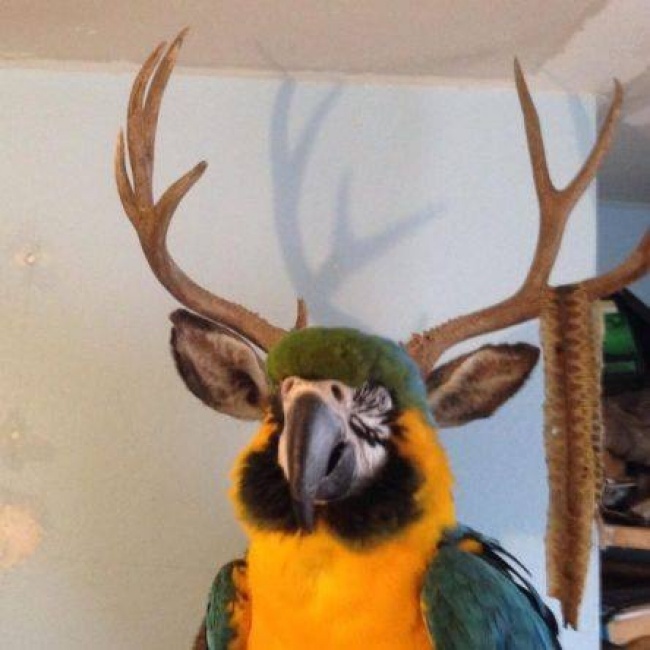 It creates the illusion of a weird parrot-deer hybrid which is an insane idea! It could never happen, but at least now we know what that would look like. The cute bird happened to be in the best position for the photo to be taken and the end result is more than funny! If you ever wondered how a parrot with huge ears would look like, now you have the answer visualized! We believe that this is one of the most interesting images in the entire list! It was meant to be confusing and to look like this, because it is obvious that there is a lot more to it than meets the eye at first. It is a very complex image full of details that altogether create the image of a human face. We love such tests because the meanings of the answers people give are curious, because they are interpreted by psychologists in different ways. We actually had to take a second look at this image before we were able to realize what it had to offer. 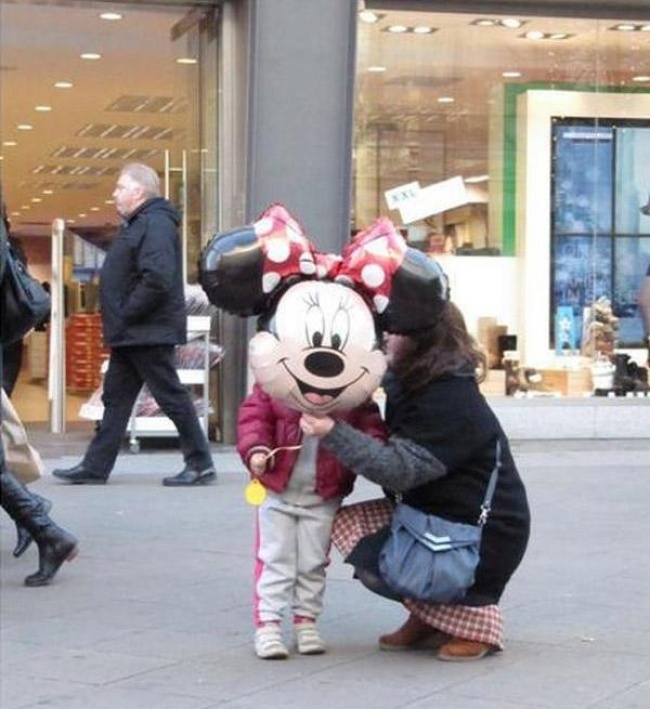 At first glance it appears that a mother is trying to set up her little girl’s Minnie Mouse costume, but when you look closer, you will see that it is not a costume. The mother is actually holding a balloon in the perfect possible position, creating the illusion that the girl is wearing such a costume. It is a cute image, though. 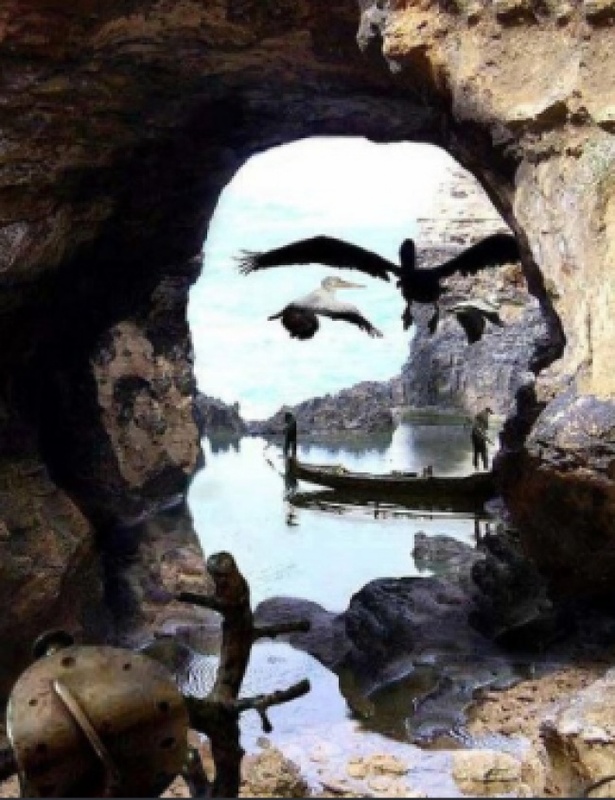 This is another amazing photograph that required a lot of patience to take! Of course, in order for it to be taken, the photographer must also have the right skills and a high-quality camera, too. However, without a bit of luck taking such an image would be impossible. As you can see, the wave hit a small rock and this was the exact moment that some photographer was waiting for. 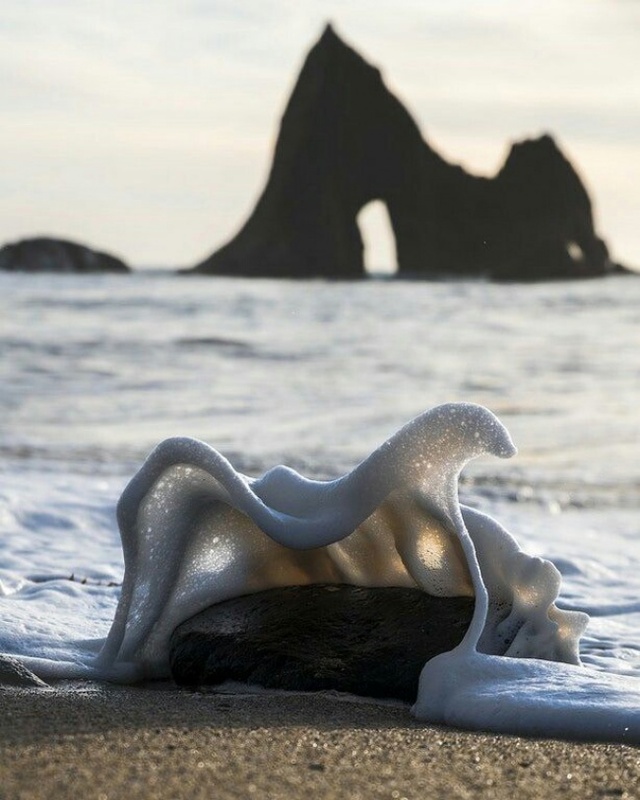 The end result is a stunning image, showing the foamy wave crashing behind the rock, just before it was about to engulf it. We love eagles in all their shapes and sizes. The majestic birds are definitely the kind of creatures that make you respect them the moment you lay your eyes on them. In this case, someone photographed an Aztec eagle from behind the window, creating a rather curious illusion! It looks as if the eagle is just chilling and scrolling through that iPhone. 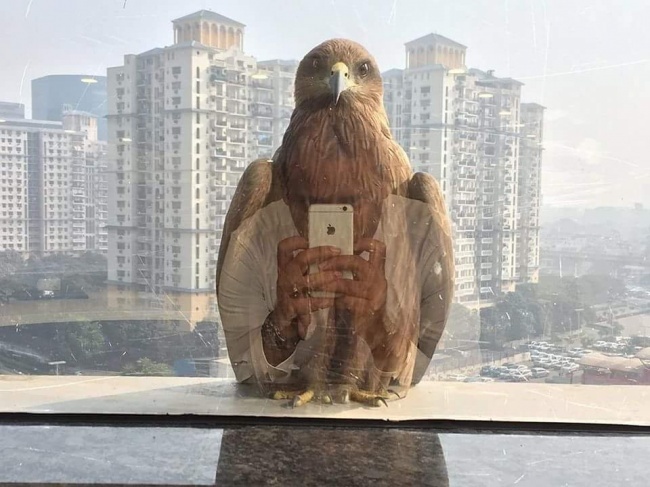 The way that the person’s reflection matched the body of the eagle was probably not intended at all but it is the thing that makes this image curious. Every now and then we get to see images that are more or less hard to replicate and this is definitely one of those images! As you can see, this man was probably waterskiing behind a boat and he probably slipped. As he was about to crash in the water, the speed he had already picked up forced him to glide on the surface. This resulted in the amazing image we all get to see. He looks like he is exercising his abs and he even looked directly at the camera! Seeing someone who chose an unconventional outfit always sparks our curiosity! Dressing up in a certain way always means that you want to express something in particular. We can all see what the purpose of this outfit was! 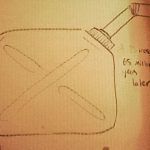 However, there is an even interesting detail about the image! 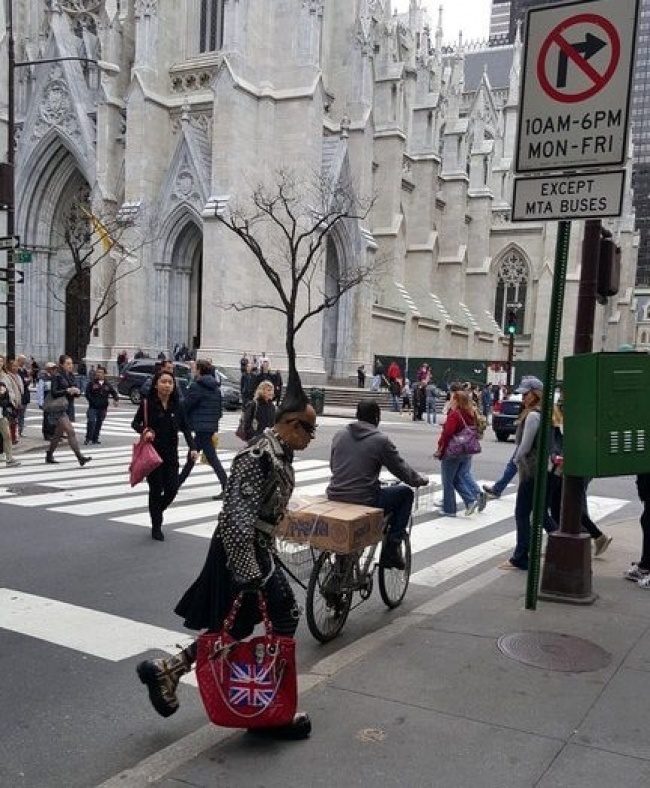 It creates the illusion that this person has a crazy tree-shaped hairdo but this is not the case. The hairstyle happened to be right in front of the tree and this created the illusion. Everyone is obsessed with taking selfies and this is not a secret. What really bugs us is that in most cases all selfies look exactly the same. People need to get more creative with the angles and location, for example! 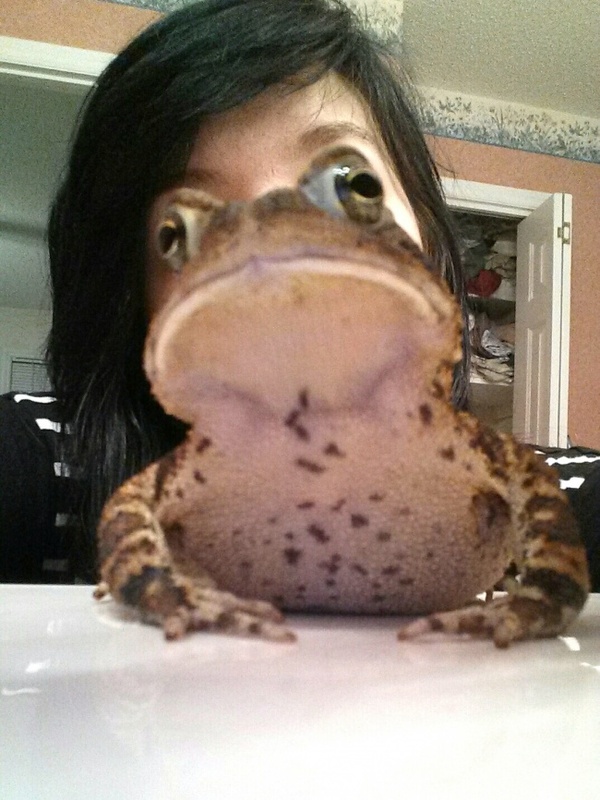 This person was able to take the perfect selfie by accident! The frog basically got in the way, but this is what made the image look so cool! The annoyed face of the animal really adds to the composition! We love grumpy-looking animals! One of our favorite kind of images are thee professional wedding photos! They always offer stunning views and beautiful and happy people. This makes these images more or less dreamy! Of course, some couples prefer to lose the fairytale theme and replace it with something hilarious. These newlyweds chose a cool location for their wedding photos but one of the images in particular turned out to be the best because of one of the details in it. 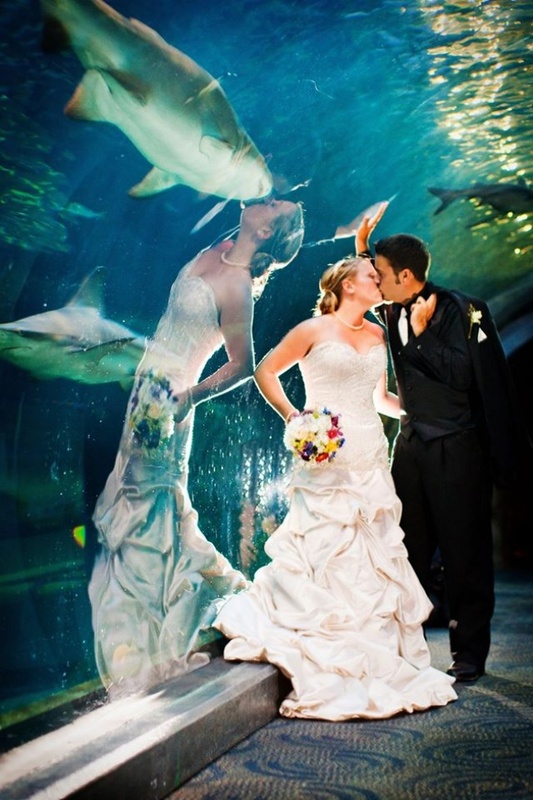 The reflection of the bride seems to be kissing with a huge fish inside that water tank and it is a hilarious thing to see! As we already said, there are probably no coincidences; we just tend to call that certain moments we have no explanation for. This image is one way to explain that. 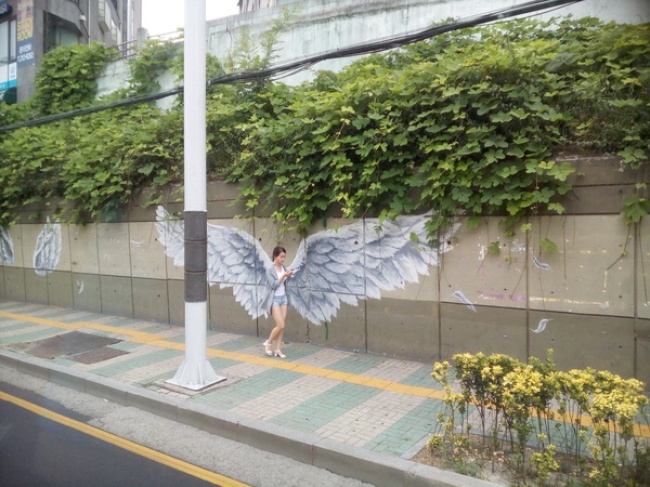 It was taken at the best possible moment and it creates the illusion that the girl has huge angel wings. Maybe the image represents he actual self and she is probably an angel to her friends and family. It is nice to see how even the colors of her outfit are a perfect match to the wings.